One of the phrases folks in the morning class have been hearing from me more and more lately, in both aikido and judo, is this: "the chin is magic." There's another phrase they're probably tired of hearing that falls along the same lines: "the elbow is magic." I'd like to film some video on my thoughts relating to both of those statements, but for now, I'll share this bit about the chin as it relates to aikido (then judo in a future post, and hopeful both and in a little more detail in video). While I've always sort of known that displacing uke's chin (or in general, his head) can have a potent effect on the rest of uke's body, I'm only recently beginning to see how wide spread the application is. Or rather, could be. Or perhaps should be. Of course, like anything else I post here, the things I talk about are probably old news to you and your school or system, but it's not necessarily the way I was "brought up" in the art, or I'm just now noticing it after all this time, so it's fascinating to me! Let's start here: as long as uke's head is lined up with the rest of his body, with his spine, he has optimal control of his entire body and over his balance. But once the head gets bent out of alignment (backwards, forwards, to the side), posture and control seem to deteriorate rather rapidly. It's also very difficult to recover from that loss of control, for in many cases, once you've moved the head out of alignment, it's fairly easy to keep it there. The most obvious place for me to start was with the first technique of junana hon kata (or randori no kata) shomen ate. Most of the forms I saw it practiced in my neck of the woods, and the way I was taught, involve placing the palm on or around uke's chin level and pushing straight ahead. For the most part, we've always practiced this as lightly as possible, where you might imagine uke has a short beard and your palm is just barely grazing the hair. You can certainly throw uke with that sort of light touch IF you have the timing right and IF you have a committed attacker (not someone who's just standing there, waiting for the technique, but someone actively engaged in coming after you), and IF they have a fairly normal nervous system. It's a great feeling when you catch uke at just the right moment and, without even touching him, he jumps out of his jockey shorts and falls to the ground like he's been shot by a sniper. You feel positively magic. 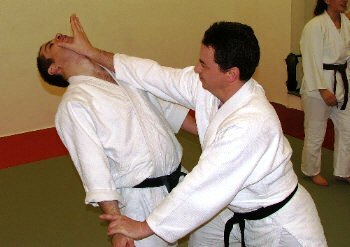 But maybe you're like me and you've found yourself in a situation where you've put your hand in uke's face (probably in randori) and nothing happens. The two of you walk around until the other guy does something to get your hand out of his face or you give up and try to make something else happen. Or you get some hulking neanderthal who just doesn't have the same "oh crap!" reaction that most of us have when something flies in our face and they don't move an inch when you do it (believe me, they're out there). Or let's look at it from a different scenario, one based a more in "real life." There may very well come a time, "out there", when the situation is going downhill fast, or perhaps a third person's safety is in question, and you need to be more preemptive. I know, I know, that goes against the whole defensive, reactive philosophy of aikido, doesn't it? Sure, but bringing peace out of chaos, I believe, is a higher principle. Sometimes you may need to bring things under control before it starts and gets out of hand. I've found that if you were to just push on uke's face in these sorts of circumstances, you may get him to walk backwards, and you may even get his spine bent back—but he never actually falls down. That's frustrated me and others I know for a long time. One way to look at it is, Well, at least I've put uke in a compromised situation where he'll need to react to get out of it, and then I'll just do something with whatever he does. That's certainly true, but we have another option. When you place your hand in uke's face, you might notice that the bump of his chin fits very nicely in the concave part of your palm, and the heel of your palm, the fleshy bottom part of the thumb, tucks nicely under his chin. Just shear your angle from a straight forward push to a forward and slightly up push, lifting uke's chin. Once his posture is broken, you can let your hand begin to sink downward as the level of his head sinks downward. I found that uke has a much harder time staying standing up. You'll also find that your fingers can easily drop and the tips find their way into uke's eyes, as well. Good to keep in your back pocket, but be nice in practice, and be extremely careful with that, too. Once I looked around at the rest of the aikido world, I began to see this sort of approach to shomen ate a little more often, but I don't think it's as common around here. All that being said, there are more applications of manipulating the chin or the head that have been rarer still to me. Stay tuned, and I'll have a video of the rest of the applications I've been thinking about!